When you ask her about her birthday wishes you get a very long description about her cake. At the moment it is a chocolate cake with loooooots of blueberries and strawberries and cream please. On top please! Presents – no wishes. But cream on top. 1. Maileg Metal Kitchen . A unit with three doors, hob top, sink and draining board. There is a yellow shelf unit and a hanging rail for cooking utensils. 2. Mini kit dodo – little baby doll in her sleeping nest. Great for traveling! 3. This deluxe pop-up version of Baum’s timeless classic The Wizard of Oz celebrates Oz’s 100th anniversary. 4. Soft glow in the dark pillow lamp to cuddle or to hang up as a real light bulb. 6. 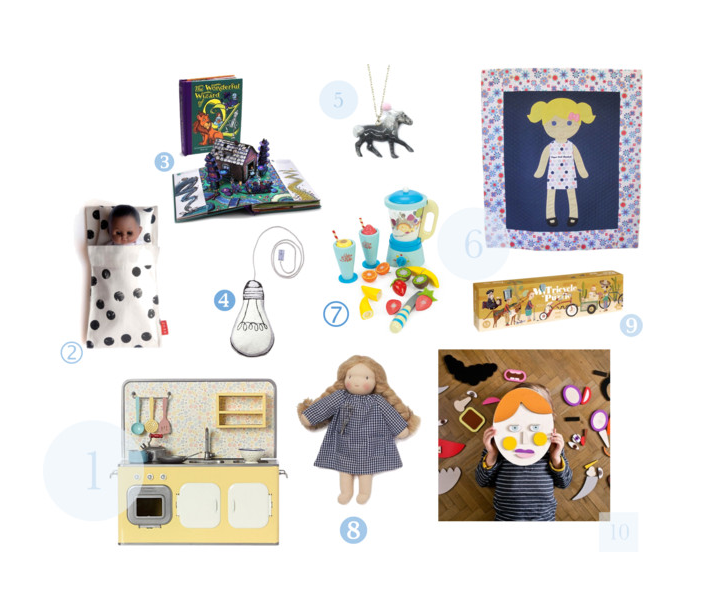 Paper Doll Blanket is a keepsake quilt, a doll, and a toy all rolled into one. This blanket comes with one dress and matching hair accessories. The bottom of the blanket has two large pockets for storing her extra outfits. Such a cute idea and something a little different for little mini mamas. 7. Fruit Blender Set with a detachable jug, 6 sliceable fruits, a play knife and 2 wooden tumblers, it comes complete with removable toppings. Miss Leonor loves smoothies. Very often she asks me to make a smoothie with her. This would be a great addition to the play kitchen. 8. Handmade doll. Truly unique dolls, shaped and sewn by hand in France. 9. An amazing 2m long and 15cm wide tricycle cardboard puzzle! 10. Portrait wooden toy. Super wooden toy to make different faces….